Sunspots have a diameter of about 37,000 km and appear as dark spots within the photosphere, the outermost layer of the Sun. The photosphere is about 400 km deep, and provides most of our solar radiation. The layer is about 6,000 degrees Kelvin at the inner boundary and 4,200 K on the outside. The temperature within sunspots is about 4,600 K. The number of sunspots peaks every 11.1 years. There is a strong radial magnetic field within a sunspot, as implied in the picture, and the direction of the field reverses in alternate years within the leading sunspots of a group. So the true sunspot cycle is 22.2 years. There is also a superimposed fluctuation with a period of 25 months, i.e. a quasi-biennial oscillation. Sunspots were observed in the Far East for over 2000 years, but examined more intensely in Europe after the invention of telescopes in the 17th century. In 1647 Johannes Hevelius (1611-87) in Danzig made drawings of the movements of sunspots eastwards and gradually towards the solar equator. In 1801 William Herschel (1738-1822) attempted to correlate the annual number of sunspots to the price of grain in London. The 11-year cycle of the number of sunspots was first demonstrated by Heinrich Schwabe (1789-1875) in 1843. 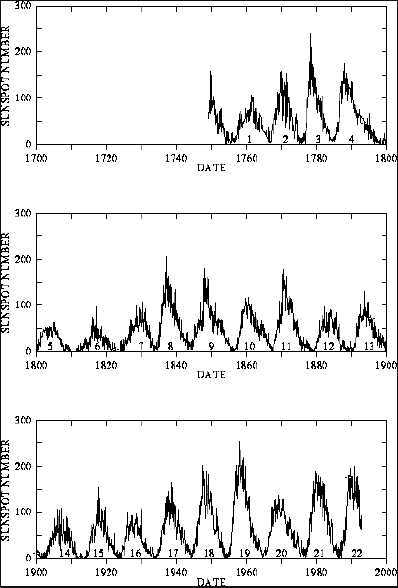 There have been several periods during which sunspots were rare or absent, most notably the Maunder minimum (1645-1715), and less markedly the Dalton minimum (1795-1820) (Fig 2.8 in the book). During the Maunder minimum the proportional concentration of radio-carbon (14C) in the Earth�s atmosphere was slightly higher than normal, causing an underestimate of the radio-carbon date of objects from those periods. By means of the premise of excess 14C concentrations in independently dated material (such as tree rings), other minima have been found at times prior to direct sunspot observations, for instance the Sporer minimum from 1450 to1540. Data from 8,000 year-old bristle-cone pine trees indicate 18 periods of sunspot minima in the last 7,800 years (1). This and other studies have shown that the Sun (as well as other stars) spends about a quarter of its time with very few sunspots. There is another well-known, super-imposed variation of annual sunspot numbers, of about 85 years. This irregular variation affects the length of the sunspot cycle, ranging from 9.8 to 12.0 years. Maxima of sunspot-cycle length occured in 1770, 1845 and 1940. Incidentally, the Sporer, Maunder, and Dalton minima coincide with the colder periods of the Little Ice Age, which lasted from about 1450 to 1820. More recently it was discovered that the sunspot number during 1861-1989 shows a remarkable parallelism with the simultaneous variation in northern hemisphere mean temperatures (2). There is an even better correlation with the length of the solar cycle, between years of the highest numbers of sunspots. For example, the temperature anomaly was - 0.4 K in 1890 when the cycle was 11.7 years, but + 0.25 K in 1989 when the cycle was 9.8 years. Some critics of the theory of man-induced global warming have seized on this discovery to criticize the greenhouse gas theory. All this evokes the important question of how sunspots affect the Earth's climate. To answer this question, we need to know how total solar irradiance received by the Earth is affected by sunspot activity. According to current theory, sunspots occur in pairs as magnetic disturbances in the convective plasma near the Sun's surface. Magnetic field lines emerge from one sunspot and re-enter at the other spot. 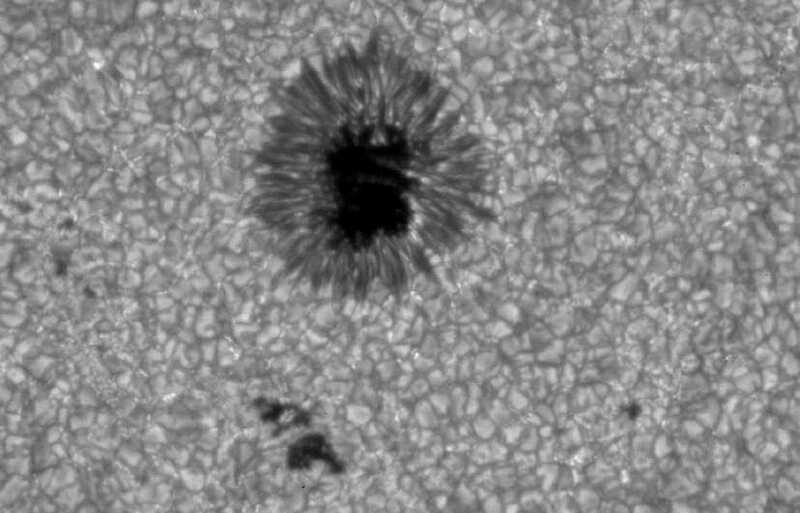 Also, there are more sunspots during periods of increased magnetic activity. At that time more highly charged particles are emitted from the solar surface, and the Sun emits more UV and visible radiation. Direct measurements are uncertain, but estimates are that the Sun's radiant energy varies by up to 0.2% between the extremes of a sunspot cycle. Polar auroras are magnificent in years with numerous sunspots, and the �aurora activity� (AA) index varies in phase with the number of sunspots. Auroras are faint and rare when the Sun is magnetically quiescent, as during the Maunder minimum. The periodicity of the sunspot number, and hence that of the circulation in the solar plasma, relates to the rotation of the Sun about the centre of gravity of whole solar system, taking 11.1 years on average. Sometimes the Sun is up to a million kilometres from that centre, and sometimes it more or less coincides, leading to different conditions of turbulence within the photosphere. The transition from one condition to the other affects the number of sunspots. Not only does the increased brightness of the Sun tend to warm the Earth, but also the solar wind (a stream of highly energetic charged particles) shields the atmosphere from cosmic rays, which produce 14C. So there is more 14C when the Sun is magnetically quiescent. This explains why 14C samples from independently dated material are used as a way of inferring the Sun's magnetic history. Recent research (3) indicates that the combined effects of sunspot-induced changes in solar irradiance and increases in atmospheric greenhouse gases offer the best explanation yet for the observed rise in average global temperature over the last century. Using a global climate model based on energy conservation, Lane et al (3) constructed a profile of atmospheric climate "forcing" due to combined changes in solar irradiance and emissions of greenhouse gases between 1880 and 1993. They found that the temperature variations predicted by their model accounted for up to 92% of the temperature changes actually observed over the period -- an excellent match for that period. Their results also suggest that the sensitivity of climate to the effects of solar irradiance is about 27% higher than its sensitivity to forcing by greenhouse gases. We do not know why the Sun spends part of its time in a magnetically quiescent state, and whether the sunspot minima occur with a regularity that is sufficient to predict when the next quiescent episode might occur. At present there is no concern about another Little Ice Age. Recent satellite measurements of solar brightness, analyzed by Willson (4), show an increase from the previous cycle of sunspot activity to the current one, indicating that the Earth is receiving more energy from the Sun. Willson indicates that if the current rate of increase of solar irradiance continues until the mid 21th century, then the surface temperatures will increase by about 0.5� C. This is small, but not a negligible fraction of the expected greenhouse warming. The relationship between cycle length and Earth temperatures is not well understood. Lower-than normal temperatures tend to occur in years when the sunspot cycle is longest, as confirmed by records of the annual duration of sea-ice around Iceland. The cycle will be longest again in the early 2020's. Eddy, J.A. 1981: Climate and the role of the Sun. In Rotberg and Rabb 1981, 145--67 (5). Friis-Christensen, E. and K. Lassen 1991. Length of the solar cycle, an indication of solar activity closely associated with climate. Science 254, 698-700. Lane, L.J., M.H. Nichols, and H.B. Osborn 1994: Time series analyses of global change data. Environ. Pollut., 83, 63-68. Willson, R.C. 1997. Total solar irradiance trend during solar cycles 21 and 22. Science, 277, 1963-5. Rotberg, I. and T.K. Rabb (eds) 1981: Climate and History. (Princeton Univ. Press) 280pp.